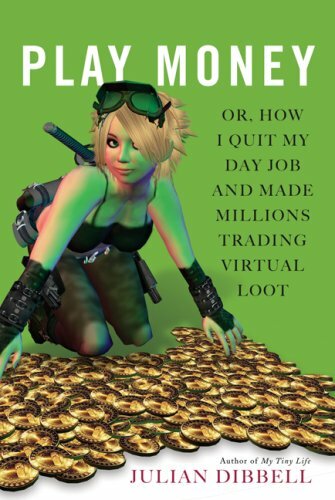 I just finished reading Play Money: How I Quit Job and Made Millions Trading Virtual Loot by Julian Dibbell. While I'm not about to quit my day job, the book reinforced a point that's becoming more clear with each passing day: the virtual is real. A lot of people scoff at this notion, or roll their eyes when they hear about the business side of MMO's. But it really shouldn't be that far-fetched for millions of Americans. This morning I saw that my son was watching ESPN's Fanatsy Football Now, where a pigskin pundit breaks down how many points individuals will get for their respective "owners" this Sunday. It's been estimated that anywhere from 14 million to 27 million people currently play fantasy football for an average of nine hours a week. If the U.S. population is about 300 million, that means that anywhere from 5-9% of the population participates in the pastime. Dibbell's book and the fantasy football industry say a few things about us – among other things, that we're increasingly becoming a data-driven people, that individual performances can trump team play, and that there's a fine line between work and play.